Protesters outside the Children's Court last week. THE PROSECUTION OF a schoolboy accused of false imprisonment of Joan Burton during the Jobstown protest is a “recipe for totalitarianism”, his barrister has argued. Judge John King adjourned the trial until 21 October to decide if he is going to throw out the case. The 17-year-old’s legal team have contended that it is not accordance with Irish or European human rights laws and that the State has not made out a case to answer. The youth denies falsely imprisoning the former Tánaiste and her advisor Karen O’Connell who were allegedly trapped in two garda cars for three hours during the demonstration at the Fortunestown Road in Jobstown in Tallaght, on 15 November 2014. He was aged 15 at the time. The Dublin west TD had been at a graduation ceremony at An Cosan education centre when a water protest took place outside. She told the court earlier that she was frightened and did not think she had the alternative of being able to get out of Garda cars surrounded by people shouting abuse and banging on windows. The State has closed its case and on Tuesday, the boy’s legal team asked Judge John King to dismiss the charges. It was day four of the trial at the Dublin Children’s Court. The boy’s barrister Giollaoisa Ó Lideadha SC told Judge King that the the case is “unprecedented” and is a “recipe for totalitarianism”. If the charge of false imprisonment is not dismissed, that would amount to a failure to vindicate the constitutional rights of the accused, failure to uphold the right to fair trial, failure to uphold the obligation on the authorities not to abuse their powers and not to act arbitrarily or in a manner inconsistent with basic fairness. Ó Lideadha has also submitted that the prosecution has failed to prove their case beyond the necessary proof of reasonable doubt and they had used a too literal interpretation of the law on false imprisonment in a case where a person was detained for seconds in one instance and minutes in another. He said his client makes no apology for the demonstration but he did certainly not want any personal trauma to be caused. Applying for a dismissal, he argued that the the prosecution has not proved that a criminal case has been caused. He said there was evidence from a statement of a Garda superintendent, who was not called to give evidence, that there was an agreement between gardaí and protesters that they could slow march ahead of a car carrying the former Labour leader. He also asked the judge to note that Ms O’Connell mentioned the agreement in her evidence. Ó Lideadha said the teenager “was never told he was committing an offence or committing a public order offence or an offence of an entirely different magnitude, false imprisonment. My submission is that the decision to charge in relation to this matter in the first place was not in accordance with constitutional rights and the European convention on human rights. He said the case touches on the right to protest, freedom of expression and freedom of assembly. He said it was a most important issue for a young person in particular who it was clear was engaging in legitimate protest action he believed was lawful. He said the teen had nothing to do with any of the unpleasant things that happened such as screaming and throwing objects while the slow march was taking place. The prosecution case is that the former Tánaiste and her advisor were detained by the actions of the teenage defendant in conjunction with the actions of others. Replying to the points raised by the defence, prosecuting counsel Tony McGillicuddy BL said the video evidence showed the teenager had a megaphone and was encouraging people to sit down around the cars. He said that there was evidence that the first garda car was blocked. At a Garda 4X4, the boy used the megaphone to encourage others to sit down and he sat down also, he said. He argued that to call it an innocuous peaceful protest is wrong when you see the evidence from Joan Burton, her advisor, gardaí and the footage shown in court. Judge John King said the case will resume next month. He said he wanted to read the case law furnished by the defence and to review the evidence and the submissions in detail. He told the prosecution and defence teams that he will give a decision when the case resumes on 21 October next. Throughout the hearing yesterday, the boy quietly took his own notes of the proceedings while his mother sat beside him. Directly in front of the youth was the lawyers’ bench completely covered with weighty law books, folders and legal documents. His barrister also confirmed on Tuesday that the defence did not intend to go into evidence should the case proceed. 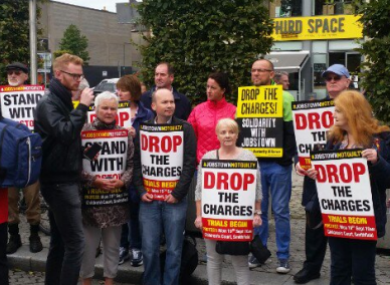 About 150 protesters including Anti-Austerity Alliance TDs Paul Murphy and Ruth Coppinger were outside the courthouse in Smithfield on Tuesday evening to give their support to the teenager. Many of the people who assembled were chanting anti-Labour slogans such as “Jobstown innocent, Labour guilty” and “Joany in your ivory tower, this is called people power”. Earlier, Judge King was shown video footage of the protest. The clips were obtained from YouTube, RTE and a garda 4X4 which at one point had been blocked while carrying the former Minister for Social Protection and her advisor Ms O’Connell. Some were seen chanting slogans while others were hurling abuse at the former Tanaiste and jostling with gardaí. Burton was hit with a water balloon as she walked from An Cosan adult education centre across the road to St Thomas’s Church for the concluding part of a graduation ceremony. She has said there was an “air of extreme hostility” at the protest and she and her former advisor said it was not safe to get out of garda cars. Joan Burton also said she was concerned about the number of children present. O’Connell said she was hit on the back, gardaí had to bundle them into a car and she was upset and began hyperventilating. The number of protesters grew and gardaí formed cordons around the then Tanaiste to protest her. Det Inspector Derek Maguire described the actions of some of the protesters as being like a “rugby maul”. He has rejected the defence suggestions that there was an agreement with protesters in relation to a “slow march”. Plastic bottles and eggs were thrown at gardaí and the windscreen of a Garda 4X4 was broken while Burton was in it, the court has heard. Short video clips taken by Deputy Burton and Ms O’Connell on their phones were also shown in court. Ms O’Connell also said demonstrators shouted at them that they hoped she and the former Tánaiste would die. She also alleged she saw a female garda getting struck after an open can of beans was thrown at her. When questioned months after the protest the teenager denied being an organiser of the demonstration and said he was sorry for the upset he caused Ms Burton. Email “Judge adjourns trial of 17-year-old accused of falsely imprisoning Joan Burton”. Feedback on “Judge adjourns trial of 17-year-old accused of falsely imprisoning Joan Burton”.